Americans are getting back to work. Sort of. 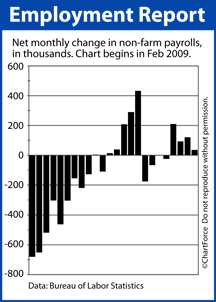 This morning, at 8:30 AM ET, the Bureau of Labor Statistics released its Non-Farm Payrolls report for January 2011. More commonly called “the jobs report”, the government’s data showed a large decrease in the number of working Americans as compared to December, but a sizable drop in the Unemployment Rate. January’s Unemployment Rate surprised analysts, too, but not in a bad way, falling from 9.4 percent in December to 9.0 percent last month. This is the nation’s lowest Unemployment Rate in nearly 2 years. Today’s jobs report is rough news for home buyers and rate shoppers. Shortly after the report’s release, Wall Street is attributing the low jobs number to “bad weather” and is choosing to focus on the strong Unemployment Rate instead. U.S. stock futures are now rising ahead of open, an increase that will come at the expense of the bond markets. Indeed, mortgage-backed bonds are losing this morning already. Conforming mortgage rates are expected to start the day at least +0.125% from Thursday’s close and, if momentum continues, could tack on an additional +0.125% before today’s closing bell. The government’s report is an excellent example of how important jobs data can be to home affordability — especially in a recovering economy. The economy shed 7 million jobs between 2008 and 2009 and fewer than 1 million of those were recovered in 2010. It’s a data point Wall Street watches closely because more working Americans means more consumer spending, and more consumer spending means more economic growth. Consumers account for 70% of the U.S. economy, after all. More workers also means more taxes paid to federal, state and local government, and, in theory, fewer loan charge-offs from banks. These, too, keep the economic engine moving forward, spurring more spending and job growth. If you have not yet locked a mortgage rate, consider locking one today. On the heels of today’s jobs data, 30-year fixed rates will scratch at their highest levels of the year.